Our next stop on the whirlwind tour of Northern California was Santa Cruz, home of the family of Rebecca's dad's sister, as well one of her grandmothers. Santa Cruz was blessed with unseasonably fogless days while we were there, so obviously our super power was to bring the sunlight to unexplored backwater lands, not unlike the White Man in 1492. 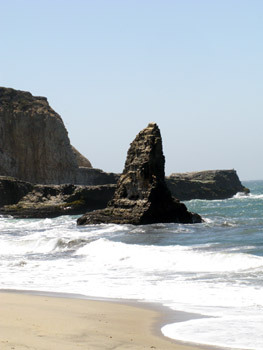 We took in a sampling of Santa Cruz beaches at Natural Bridges, a beach covered in seaweed and a dead sea lion where everyone in bathing suits stands at the edge of the fifty degree surf, shivering, and then goes home. We also went to Roaring Camp, where we took an overpriced steam train ride up the mountain to have a picnic lunch amongst the redwoods, although we did not go anywhere you could drive a car through a tree trunk. For dinner, the DeLeon family brought out their best grilling recipes and we dined on giant slabs of marinated London broil and spare ribs. The next day, we drove down the coast to Monterey, a waterfront area completely taken over by large gangs of sea lion pirates, commandeering rocks and boats alike. We were swarmed on either side by people trying to give us free samples of clam chowder, including a hippie who wanted to make sure I wasn't from Langley before giving us the samples. We had our first taste of raw oyster here, with "oyster cocktails" consisting of two oysters in a cup of brine with some lemon and cocktail sauce. The texture is definitely memorable -- I don't know whether it's worse to chew it or swallow it whole -- but I could see it becoming an acquired taste. On our last day in California, we drove up the coast on Highway 1, taking in the vistas and occasionally stopping at a public beach. In general, there were very few signs that California as a state was flat broke, but the most noticeable was the overly full port-o-potties dotting the coast, which easily contained several weeks of digested food from the oceanfront Taco Bells and sometimes piled higher than the seat lid. When it came time to tally the final score, we agreed that California has nothing on the Outer Banks when it comes to beaches.